It’s not a question of “falling behind”, that’s a given. It’s a question of figuring out what packages are outdated and by how much. You need to be responsible with when and how you upgrade. I enjoy the lets-see-what-breaks approach to upgrading… it’s often faster and more definitive than researching CHANGELOGs and READMEs for clues. If you want to jump to the latest version of everything, let’s talk about ncu. 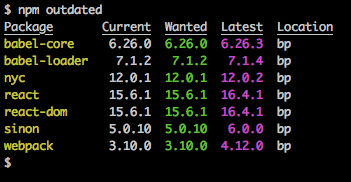 The output might be a little easier to parse compared to npm outdated. 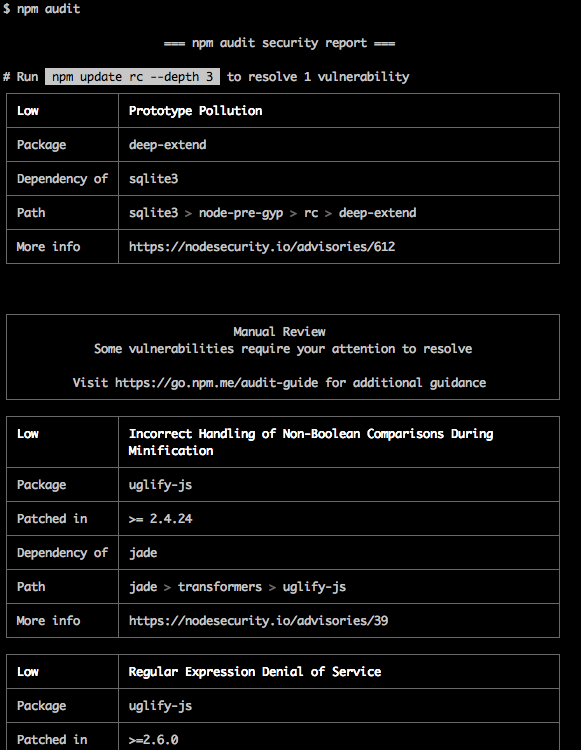 But the real value happens if you run ncu -u: it will update your package.json with the versions from the 2nd column. Even if you don’t want all the changes from ncu -u, I find it’s easier to run it and revert lines from the package.json manually. 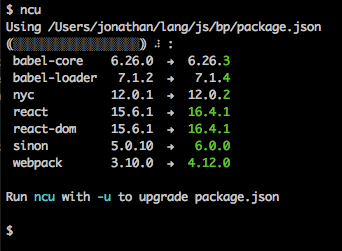 It certainly feels faster than copy-pasting version numbers in package.json. depcheck does not trust what your package.json says, it goes out into the project’s code and verifies. For each dependency, it checks that it is required. 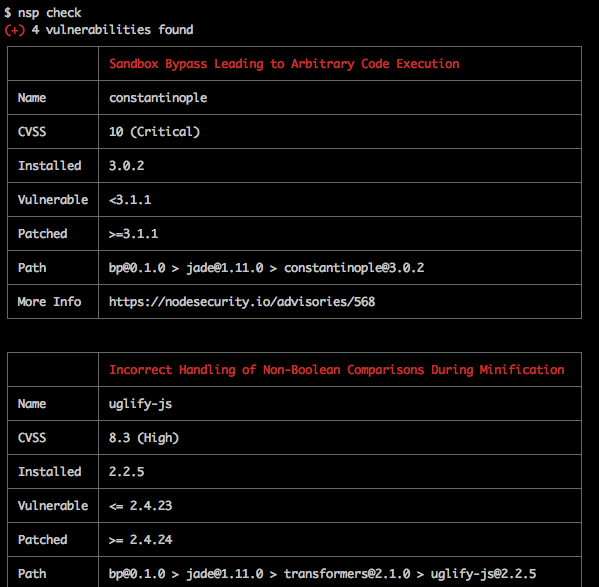 Conversely, it checks that each require is present in the package.json. It’s not perfect, but it’s better than the alternative (hoping everything is ok?). There are ways to configure it to ignore false positives too. Check the README for more details. Whenever I encounter a package I’m not familiar with, I check the Github’s README to give me an idea of what it’s used for. For example, what is cross-env? That will open your browser to the homepage entry of a package’s package.json. But I found that using yarnpkg.com (here: cross-env) is the best experience. You don’t have to use yarn to enjoy their search engine.